Le Creuset Dinnerware Le Creuset dinnerware pieces are a vibrant expression ofcolor and character. These stoneware pieces features Le Creuset's legendaryraised rings and a perfectly matched pallete of signature shades. Each pieceof Le Creuset dinnerware is crafted in the same careful process as all LeCreuset stoneware - with a colorful, durable exterior enamel that matchesother stoneware flawlessly while protecting from utensil marks and scratches.Every plate, bowl and mug is designed to complement any collection ofstoneware, and is finished with Le Creuset's signature three-ring accent alongthe exterior. Features High-quality exterior enamel protects against metalmarks and other damageHard-wearing, impermeable finish fired at temperaturesas high as 2192 degrees F is safe for cutting on with knivesUnmatched thermalresistance from -65 degrees F to 500 degrees F -- safe for the freezer,microwave, oven, broiler and dishwasherLess than 1% porosity, blockingmoisture absorption which can lead to cracking, crazing and rippling along theinteriorUnique clay mixture that creates a very dense material when fired,maintaining even temperatures and preventing scorchingResistant to stainingand flavor/odor absorptionA perfectly color-matched palette of bold,consistent tones for easy mixing and matching with other Le Creuset productsIntroduction All items in the Le Creuset stoneware range are original designsand have been hand-crafted, making each piece unique. Due to this uniqueness,there may be slight variations from piece to piece. Le Creuset Stoneware issafe for use in the microwave, freezer, refrigerator, dishwasher, oven andbroiler. The maximum oven-safe temperature is 500 degrees F / 260 degrees C.The enameled surface is easy to clean and scratch-resistant. The enamel iscompletely hygienic and will not absorb odors or flavors. 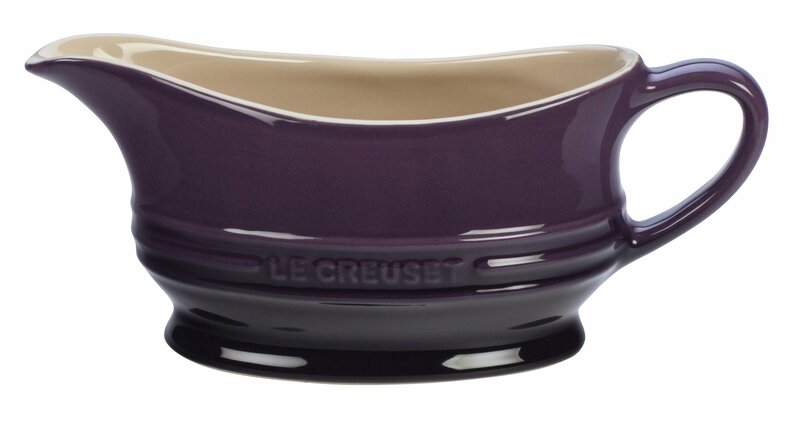 Le Creuset Stonewareis extremely strong and durable, and resists staining, chipping and cracking.The handles, knobs and rims have been designed for a secure, easy-to-holdgrip. Cleaning and Care DO NOT use any Stoneware piece on the stovetop or anyother direct heat source. OVEN: Maximum oven-safe temperature is 500 degrees F/ 260 degrees C. Use oven mitts for lifting at all times. BROILER: When usingunder a broiler allow a gap of no less than 2 1/2 inches between the rim ofthe dish and the heat source. MICROWAVE: Handles may become hot duringprolonged microwave use, especially if the handles are enclosed with plasticwrap. Cover just the open top of the dish, leaving the handles exposed.FREEZER-TO-OVEN USE: Do not place a frozen dish of food in a preheated oven.Place the frozen dish in a cold oven and set the temperature, allowing thedish and oven to heat together. Before serving always check that the center ofthe food is completely and uniformly hot. CLEANING: Before the first use, washthe dish in hot, soapy water, and rinse and dry thoroughly. For most day-to-day cleaning, cool the dish for a few minutes before washing and drying, orwash in the dishwasher, allowing the full cycle to complete. Never leave adish fully immersed in water. For removal of stubborn residues allow the dishto cool, fill with warm, soapy water and allow it to soak for 10 to 20minutes. Wash in the usual way using a plastic brush or scouring pad ifnecessary.